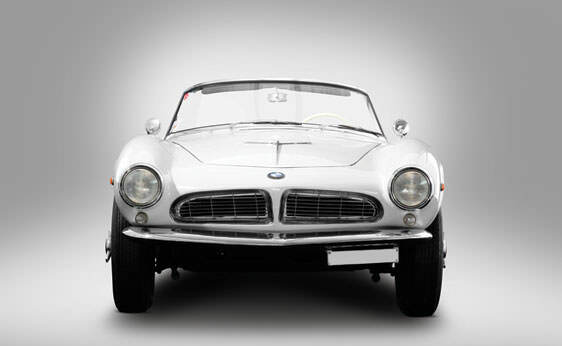 The 1956 BMW 507 is still considered one of the sleekest vehicles ever produced. BMW had originally planned to import the 507 to America but the extremely high price tag made Americans reconsider the purchase. Owners of one of these highly desirable cars are able to fetch a small fortune when selling one today. Only 252 1956 BMW 507’s were ever produced. The car was initially designed to appeal to the sports car market. Max Hoffman persuaded BMW to produce a roadster model after the BMW 501 and 502. BMW was far ahead of the times in producing the vehicle which has since achieved a celebrity status and is highly sought by collectors. BMW originally set a price tag of $5,000 dollars. Production issues with the 507 caused the price tag to swell to $9,000 dollars and eventually land at $10,500 dollars. This extremely high price point caused the vehicle to be out of reach of the target audience for the car. Several celebrities purchased the 507 including Elvis Presley and race car drivers Georg Meier and Hans Stuck. The limited number of BMW 507’s ever produced has made the vehicle one of the most highly sought after classic cars of all time. Two hundred and fifty two 507’s were originally produced. Classic car enthusiasts put the number still in existence at an amazing 202. This car which originally sold for $10,500 is able to fetch a whooping $900,000 to $1,000,000 price tag when currently sold.